Fashion has been colliding with art at least since Tristan Tzara and other Dada provocateurs took to the stage of Zurich’s Cabaret Voltaire a century ago, wearing outlandish costumes created in the same anarchic spirit as the movement’s poetry and art. A decade or so later, legendary designer Elsa Schiaparelli, after rubbing elbows with Jean Cocteau and Salvador Dalí, invented a “Lobster Dress,” an “Eye Hat,” and another fetching chapeau shaped like a shoe. Closer to our own times, Nick Cave’s spectacular Sound Suits—adorned with sequins, doilies, fur, toys, and other improbable embellishments—could be said to straddle the worlds of performance, art, and fashion. Among E.V. 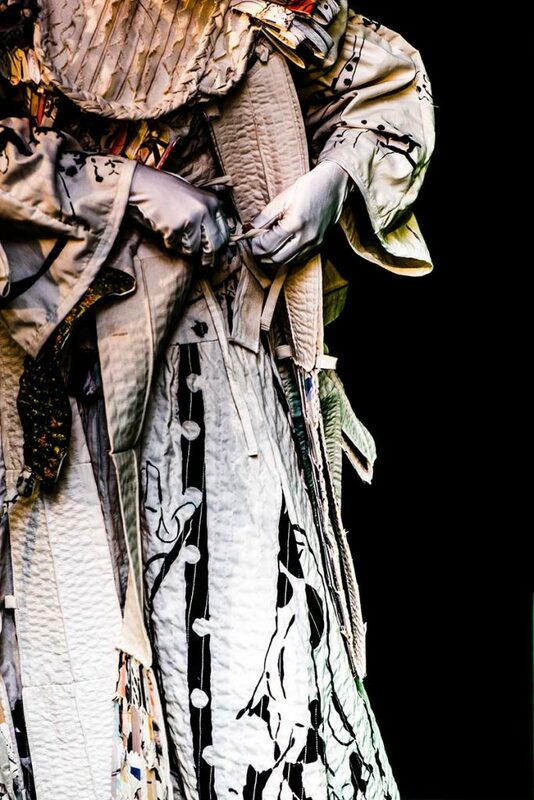 Day’s “Exploding Couture” projects was the transformation of 13 of the Metropolitan Opera’s costumes into an extravagant installation known as Divas Ascending. The British-Nigerian artist Yinka Shonibare has made a name for himself with sculptures that pair headless dummies with “Africanized” clothing. And the list goes on. 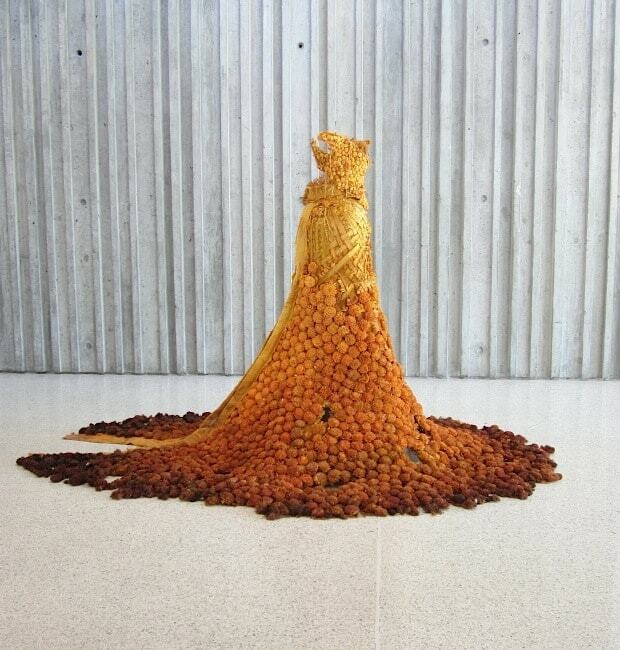 Can fashion be art? Art fashion? I use “fashion” in a very loose way, far removed from the world of haute couture and Vogue magazine, because when artists approach clothing, costume, apparel, or whatever you choose to call it, the results generally provoke a different response from the applause that greets a well-clad model on the runway. 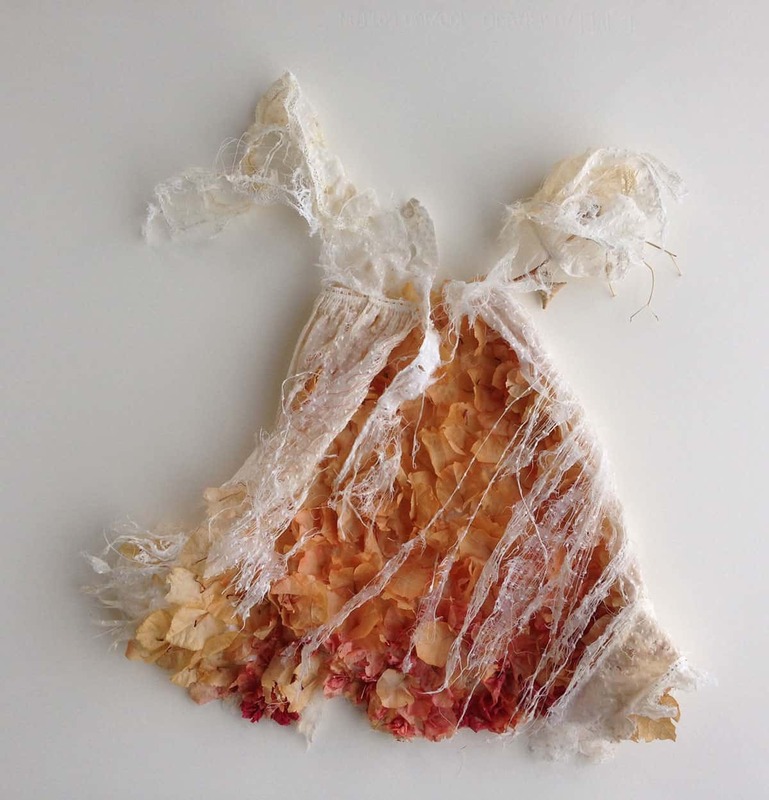 Noting that at least three members of Vasari21 are in one way or another involved with “sculpture” that references apparel, I zoomed in for a closer look at how artists are borrowing and transforming the language of clothes. To these rough and sometimes dangerous materials, Cooke added more enticing embellishments: seashells, lace, and chips of precious and semi-precious stones. 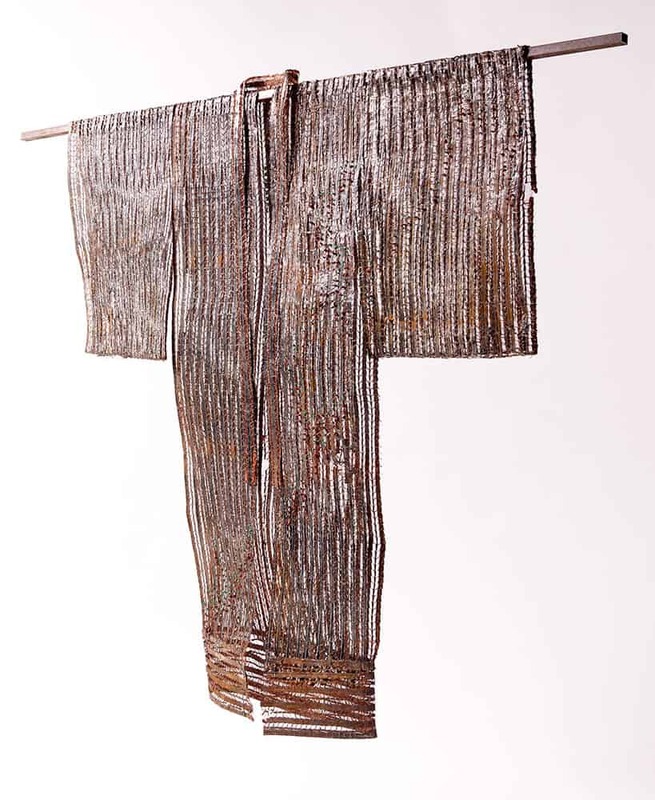 Her Kimono, for example, is made from steel mesh hammered to lie flat, and is lined with copper and woven with chips of emerald and red jasper. 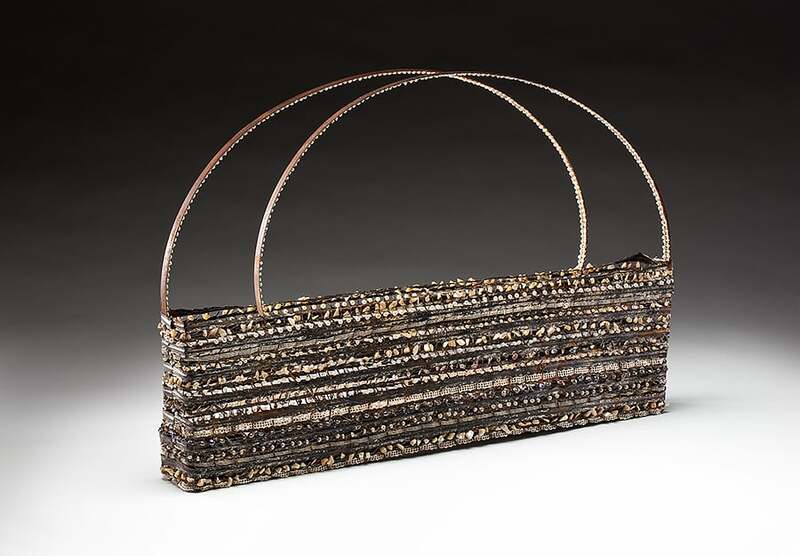 Shell Bag features seed pearls and abalone shells, but its handles are made from bandsaw blades and inside are bullet-shell casings. And Butterfly, floating as airily as a dream, is spun from aluminum, glass, and garnets. 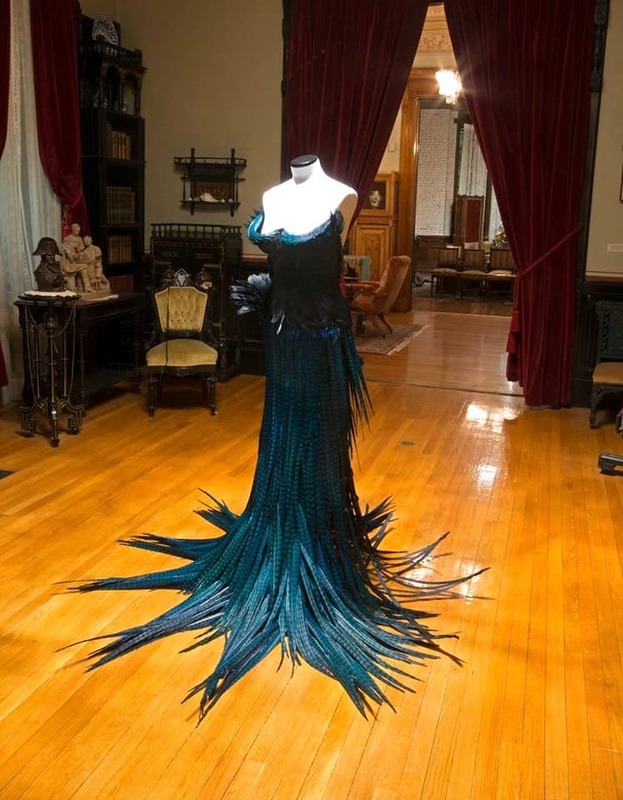 Catherine Latson’s sculptures also start with materials, but in her case she looked to the natural world—tapioca root, magnolia leaves, sea-urchin shells, moss, amaranthus, hydrangea petals, and peacock feathers—often to create improbably glamorous garments that in some cases can be worn. Many, like Adrift, look “partially decomposed, as if they’ve lived a life,” she notes. To make the armor, Collura enlisted the help of a student who knew how to sew and tailor garments. 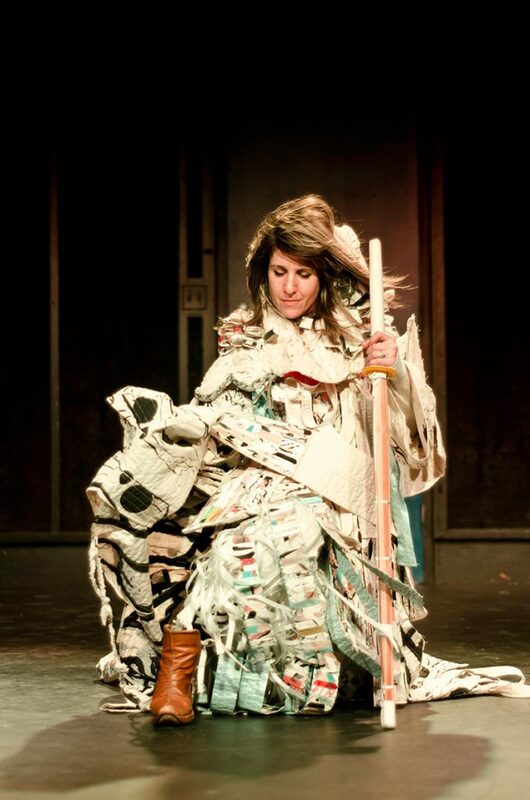 “We made the starting layers with the notion that it would be a performative work,” she says. “There are ten layers—the armor has underpants, skirts, a chest plate—and when I put on the layers I can move with them.” The short video posted here, a link to chapter one only, gives an idea of how compelling the piece looks in action (a longer video will be up and running shortly, and a performance will be part of the show called “Prince” at the Smack Mellon project space in Brooklyn in early 2019). 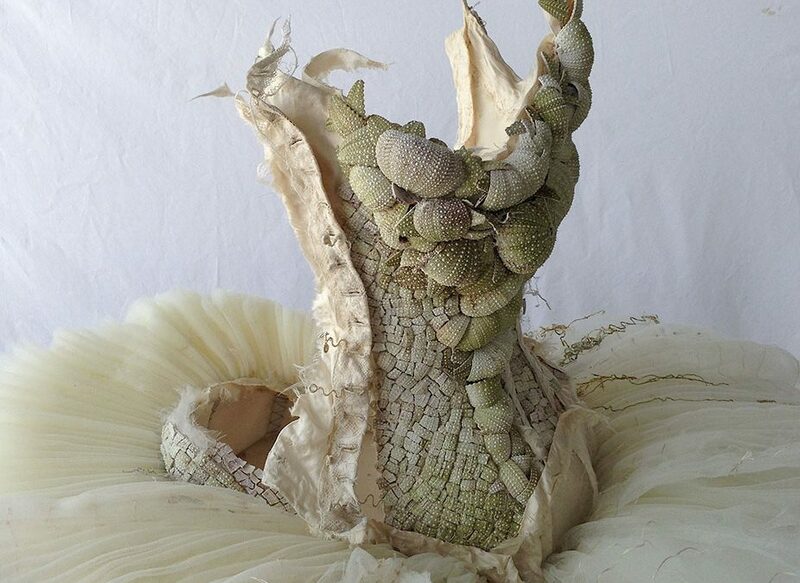 Top: Catherine Latson, Sea Urchin Tutu, shells, deconstructed Victorian bodice, tulle, wood veneer, whalebone, antique tatting thread, and cotton batting, 24 by 34 by 24 inches. Love all of these artist’s work. Fascinating and stunning! Great use of materials. 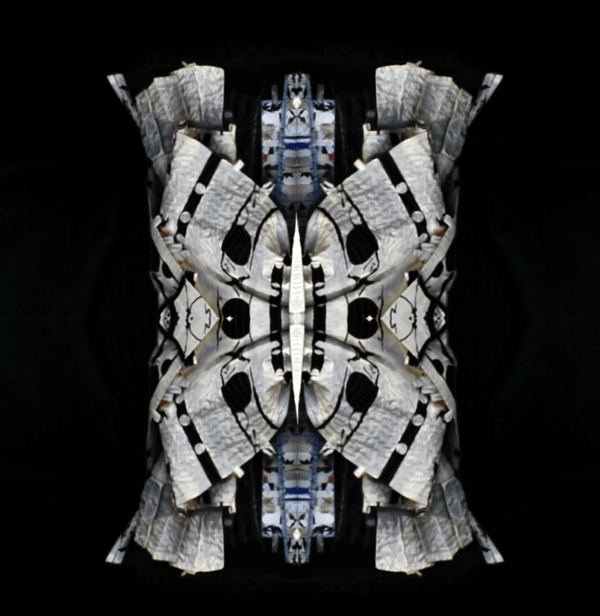 Bonnie Collura’s video is intriguing and mysterious. 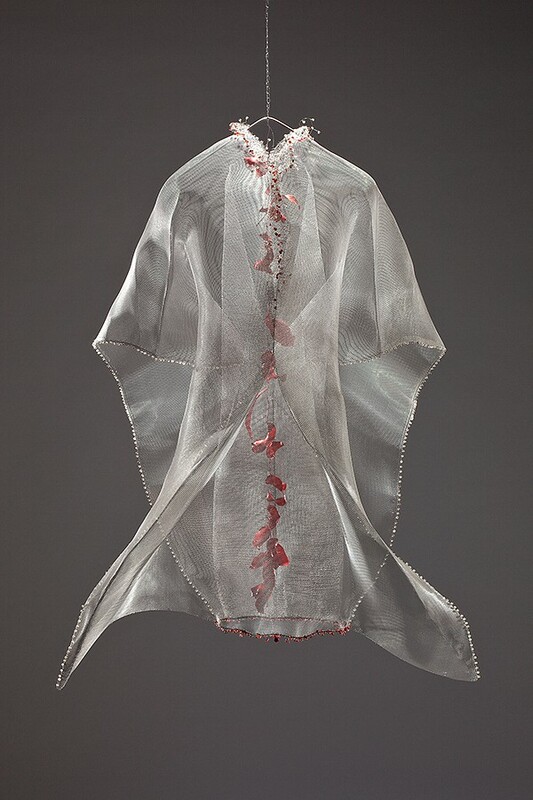 Great article and fabulous fashion approaching fine art. Fascinating piece! I blend clothing, costume, cultural history and images to comment on the legacy of my Iraqi Jewish by way of Bombay heritage. Also was immersed in the beautiful French lace my family imported. East meets West! This is some really fantastic work!! Ravishing and complex in content and form. Excellent works thank you for bringing them to our attention. These are incredible. I’d missed this content — that you for reposting it. -Kate (met you with Kate Petley in Boulder). Thanks, Kate! I remember you well….hope to make it back to Boulder sometime soon.